A few weeks ago, Nathan and I joined a two-day hike up to the summit of volcán de Acatenango just outside of Antigua, Guatemala. It was a tough climb. Armed with 4 liters of water each and a bushel of high-carb snacks, we reached our base camp at about 4 o’clock pm. We could just see the faint silhouette of volcán de Fuego behind the clouds. Eventually, the clouds rolled away and we had a full view of the cinder cone, which rumbled and spewed black columns of smoke. 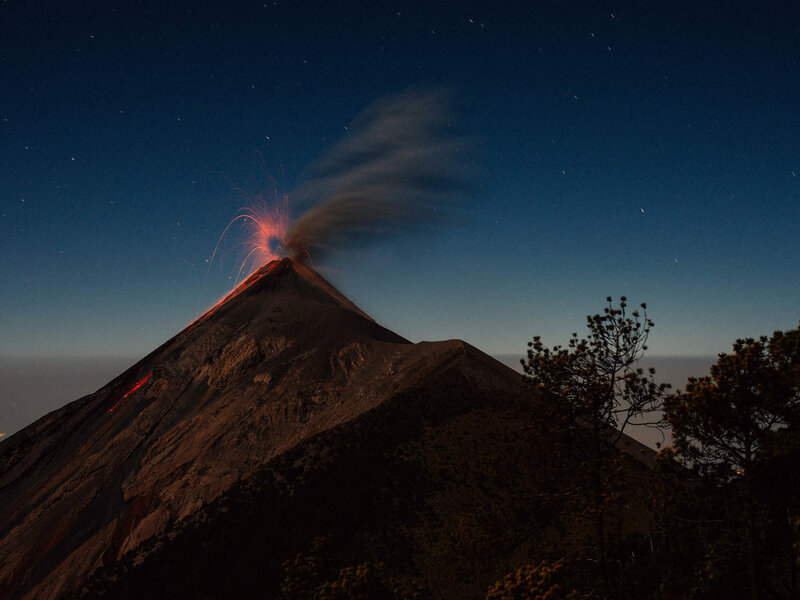 As the evening deepened, the eruptions came about every half hour, and our group sat around a campfire, whooping in primal awe and delight as red-glowing scoria peppered the darkening slopes. We slept here, among the last of the vegetation at these heights. Or rather, we tried to, as it was freezing cold and the “zero-degree” sleeping bags provided by the tour company were fit only for living room slumber parties. The next morning, we set out shortly after 4:30 am, and there remained a two hour, near-vertical climb to the summit. We had only been hiking about fifteen minutes when my ears filled with a high-pitched ringing. My fingers and toes began to cramp and my vision seemed to lie at the end of a long black tunnel. Minutes ago, I had felt like I was hiking well within my physical limits, even though I was tired. Now, my body was forcing me to stop. I was sick to my stomach and disappointed and angry. Altitude sickness had ambushed me once again, as it had at the top of the pyramid of the sun in Teotihuacan. I told Nathan and the guide who had stayed with us that I didn’t think I could finish, and I sat on a rock for a long while, trying to regulate my clipped, ragged breath. And as much as I hated the thought of missing the spectacle of the sunrise at the top, I hated even more the thought of letting Nathan down. My options were to sit in the cold, cold dark or continue to the summit. There was no going back. We’ve spent a lot of time around volcanoes in the last four and a half months. Smoking La Malinche welcomed us to Puebla, Mexico; we hiked San Pedro and Acatenango in Guatemala; and we swam in the caldera lakes of Atitlan, Guatemala, and Apoyo, Nicaragua. In Central America, it is a rare day that we do not pass several volcanoes squatting in the distance, the velvety tucks and folds of their topography wrapped around them like robes. As we climbed Acatenango, the rocky, terraced plots of farmland scattered across the base of the cone eventually gave way to a moist, ferny zone, where tangles of slender trees were blurred further by a hairy filagree of moss. Every so often, the greenery put forth a single, red blossom. Sparse coffee bushes with ripening, rust-colored berries studded the machete-carved path. Very suddenly, the verdancy subsided, and we found ourselves among tall stalks of thistle, their bristly grey heads crowned with yellow thorns, and chartreuse lichen clinging to what trees remained. The stillness was nearly complete. Wildfires had left only blackened stumps of branches. A dense white fog tumbling and curling about it all was the only movement; the shrill whistle of a hawk the only sound. Green volcán de Concepción presides over us now, capped with a white cloud and framed by palms. The sight of it taps right into my “Land Before Time” childhood fantasies, and although it imparts a peaceful air, it remains far from familiar. So many familiar elements from home turn up in Nicaragua. But here, they are amplified, just as elements from waking life are amplified in dreams. Take the blue jays, which are just as attention-deficient and as full of self-importance here as they are back home. But here, they’re much bigger, with crests so flamboyant that they bob and sway in the breeze, and with tail feathers that trail behind them as they swoop from treetops to tabletops to the backs of chairs and back again. Today, I spied a dead moth as large as my palm buried under the lettuce piled on my tostada, just as I was about to take a bite. In San Francisco, finding a tiny creepy-crawler clinging to organic greens is not unheard of—it’s the price you pay for food raised outdoors. But this moth—now this was the stuff of my nightmares. I saw the tip of one partially destroyed wing first—the fine, veiny armature, and the gossamer-like material in between, blended right in with the dappled leaves of romaine. But the longer I stared at it, the more it looked like the frayed tail fin of a fried fish, which is also served at our hostel restaurant. I sat and stared, my tostada still in hand, before the distress of my situation sunk in. The turning of my mind, as a leaf of lettuce became a fishtail and then a moth, was as foggy and slow as in sleep. It wan’t the Flor de Caña slowing me down. It was the dreamy rhythm of life in this place creeping into my blood. I wonder what it must be like to have grown up with volcanoes nearly always within sight; what force they exert on the imagination. Perhaps I can only speak for myself of the force they exert on mine—to make my daily trips to the market; to think; to be thoughtless, in the shadow of volcanoes. To have always, within my subconscious, what could be considered an icon for the the subconscious itself—dormancy, eruption; a deep slumber, an awakening. A volcano. Naturally, I draw a connection between volcanoes and dreams. It is the nearest approximation I have for regarding the very mantle of the earth as it rises into view, made of stone so hot that it melts. It is my nearest frame of reference for considering the pace of continental and oceanic plates carrying whole countries, in which the pace of life seems to carry us all from one hammock to another, but which teeter always on the brink of uprising. It is the only way I can make sense of this volatility that is so easy to mistake for stasis, until it isn’t. Toward the end of February, I departed Guatemala City by chicken bus to return to the town of San Marcos la Laguna, where I received my second degree Reiki initiation. I was proud to have coordinated the five-day trip on my own, and grateful to be on my own for the first time in nearly five months. My teacher and I elected to hold my initiation ceremony on the shores of lago Atitlán, which is ringed by volcanoes that rose up millennia ago after another enormous, unnamed volcano erupted. When the initiation was over, she implored that the spirit of lake, this collection of thousands of years of rain and snow in Central America’s deepest caldera, remain with me always. As a symbol, I couldn’t hope for a deeper, clearer well from which to draw. My altitude sickness eventually passed, and I felt well enough to continue up Fuego. Pink glowing dawn arrived while we were still far from the summit. I focused on taking one step at a time, and choked back panic as the wind rifled through our ski jackets and lashed at the whites of our eyes. The terrain during the last half hour to the top was pure grey volcanic ash, and with each step forward, I slid two long steps backward. At the ridge, there awaited for me no sense of triumph. I returned high-fives utterly bewildered by the sheer power of the elements. In fact, I felt very small looking down upon Fuego, in the scathing wind. I managed to take a few shaky pictures. The stray dogs who had followed us up to the top shrank from the wind and flattened their bellies against the earth.